According to the Vision Impact Institute, 71% of people in the United States wear glasses. Most people agree they purchase an eyeglass repair kit before purchasing a new pair of glasses. 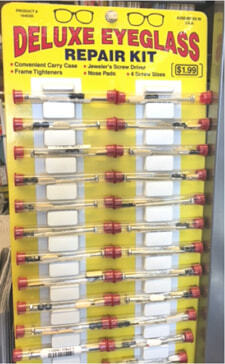 Petro Packaging specializes in clear plastic tube packaging for eyeglass repair kits. We offer small diameter sealed bottom packaging tubes perfect for packaging eyeglass repair kits! These tubes prove to be a very smart and efficient package for the tiny and delicate parts inside that serve a very useful purpose. Many times these tubes are placed on a large display featured in well-known grocery and convenience stores.